To me, one of the most interesting challenges of fly fishing on multi-day hikes is coming up with a system that allows you to carry all of the essentials without lugging a 15 lb. vest up the trail. Although my system is constantly evolving, here’s one that I found works well. Total weight (including rod): 7.3 oz. Contents (from top, then left to right). 1. Tenkara Iwana 12’ rod. I don’t carry a case. 2. Gossamer Gear Hip belt pocket. This can be worn on my belt, hip belt, or I can tie paracord around the loops on each end and wear it around my neck. 3. Stream Works Micro Forceps. These also have scissors built in, eliminating the need to carry nippers. 4. Cliff Day’s Worth fly box. Great organizational features and customizable. 5. Tippet spool. I change the size depending on where I’m going but it’s usually 5x or 6x. 6. 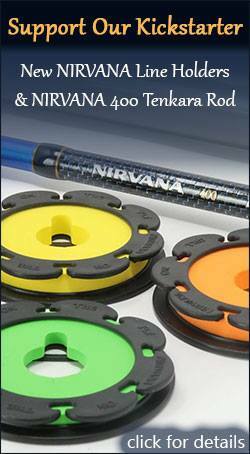 Tenkara fly line and spool for storage. 7. Micro dropper bottle containing floatant. I don’t need to carry the full-size bottle. All in all, this is a very compact system and I haven’t felt the need to add anything yet. Keep in mind, this is for small stream trout fishing only. So what does your system look like? I started a thread in the forum for you to share. I am from Missouri and I usually can’t combine my trout fishing with backpacking like people in Colorado can. I have my normal 10 pound vest, ( I should weigh it ), and every once in a while I try to get it down to 1 fly box, I just can’t ever really scale it down. But when I’m on a tail water (Lake tanneycomo, White river, or Norfork river) or a spring (Bennett Springs State Park or Roaring River State Park) I am not walking that far and weight is not an issue. Any way the reason for my comment, I would be interested in a picture of your one box of flies. I just don’t have the will power to do just one fly box. One more thing, how does the tenkara rods do on big open water with 14inch fish and heaven forbid these tailwaters can easily produce larger fish. I think I will end up buying one, just wondering which one. I have a couple bamboo rods and really starting to enjoy slower rods. From a midflex to a fullflex rod, and normally we put about a one weight heavier line on most of our rods. Sorry, I should have stated that. It’s a medium. What size of hip pocket? S M or L? Thanks. 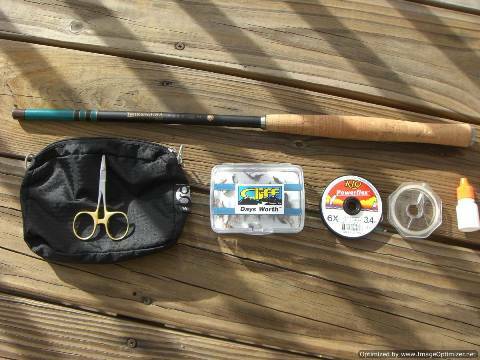 cool site and article, can you do a start up kit for a noob to flyfishing? Cheaper, smaller, lighter and much cooler than the micro dropper bottle for floatant is the tiny fish shaped soy sauce bottles that come with sushi. You can even bore a lanyard hole in the tail. Great article. Love your site. You will be seeing a lot of me! Hmmmm…looks like a similar design but I can’t believe the quality is anywhere as good as Tenkara USA rods. 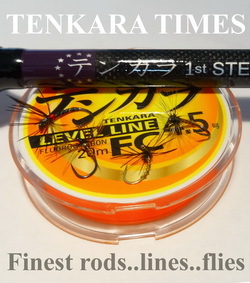 the rod listed in the link above comes with over 170 gramms – not the “reel” thing for tenkara-fishing. the genuine tenklaras comes in aprox the half of weight. myself owns a tenkarausa “ayu”, and the somewhat better quality and exclusive designed swiss tenkaras from edelweiss-fishing (e-deruwaisu). latter packs also smaller than regular tenkaras. 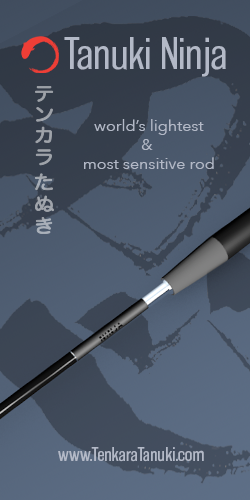 What makes you think this is not a real Tenkara Rod? It is in fact a Tenkara USA Iwana. Do you have a link to the Swiss versions? I have a Tenkara rod I bought for £3 here in the UK. It performs the job perfectly well. There is absolutely no need to pay $100+ for such a simple tool. Also, if you’re serious about ultralight fishing then a handline is the only way to go. I can catch fish with a less than 40grams/1.5oz of equipment. 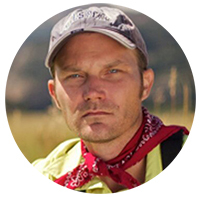 BTW Jason, it seems a little odd that you have put together such a blatantly commercial website when previously you seemed to be an advocate of the build-it-yourself-and-share-the-knowledge side of backpacking. Shame but I guess we all have to make a living somehow. I don’t think it’s “blatantly commercial”. I don’t have a lot of content yet because it’s been winter so it was hard for me to do any flyfishing videos. But now that spring is here, I will be adding more content. With the blog, videos, and forum being the majority of the site and only one tab dedicated to selling gear, I think the balance will be appropriate. I’m still an advocate of DIY and you will see that once the new content is up. My goal is not to make money with this site. Believe me, I spent several thousand dollars on just the website design and I’m certainly not making any money. The only reason I have a store is because I wanted a place to assemble unique gear that works well for backpacking and fly fishing that you can’t find at places like REI or Cabela’s. If it helps me recover some of the costs of the site, that would be great. But I’m doing it more for people who share the same passions I do and appreciate unique gear. I will have some cool new products that you haven’t seen before coming out soon. But if the commercial side rubs you the wrong way, feel free to ignore it and enjoy the blog and the forums. Anyway, thanks for your comments and I hope you stick around to see what the site evolves into. Cool! Great to read that your DIY principles are still sound. I definitely will stick around to watch this (very nice looking) site progress. It is amazing! Delivered to my door all the way from China for only £6.50. I have to agree with Dave that this is intended to be a commercial site. When looking for information about poles there is none other than the ones being sold. I ordered a selection of rods from http://www.sourcingmap.com and they are awesome. I figured that if they were not of good quality I would let my kids use them. Well, they are nice and I saved enough money to get some Titanium gear to save weight on. When it breaks and they all will if used, then I will not be crying over the loss. Like I said above, the site barely has any content yet. But soon, it will be a much better resource and content driven. Check back from time to time and you’ll see. good luck with the rods. I hope they work out for you! Well if you’re not hiking far in, I don’t think you need to restrict yourself to one fly box since weight is not really such an issue. This setup is really for people hiking miles into the backcountry and staying at least one night. 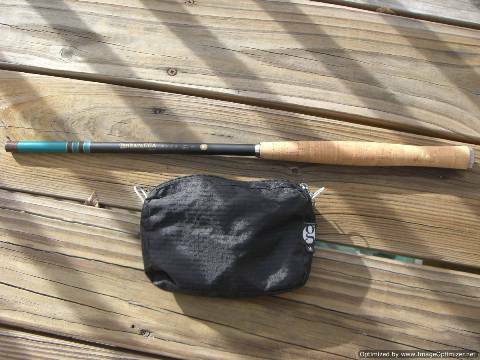 Tenkara rods can handle fish over 14″ (look at the Yamame) but it might not be right for the style of tailwater fishing you’re doing. I’ll get a photo of my fly box up soon. I’m working on a lot of content to bring this site back to life so be patient and good things will come. Jason, I’ve been following your websites for a long time, and I’m astounded by the string of comments here. Sure, backpackflyfishing is linked to the concept of tenkara fishing because it’s what Jason, as an expert lightweight hiker and fly fishing guide prefers to use. Sure, he recommends DIY for backpacking, but that doesn’t mean everything he does has to be the same. Conveniently, he’s created different blogs for these. The walkincountry link provided is for the kind of person who wants to randomly catch fish with a line and a gatorade bottle with no technique or challenge. If you want to do something like that, get a cat-o-matic automatic reel from bass pro or a fishing noodle from walmart. Jason is sharing a technique for getting at the fun and challenge of fly fishing with equipment light and strong enough for backpacking. Keep up the good work, Jason. Thanks Erik. 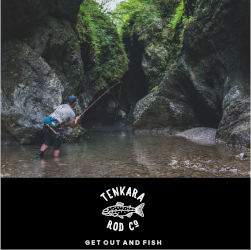 Just to clarify for everyone, I don’t push Tenkara rods because I’m trying to make a sale–I push them because I really believe they are the perfect fly rods for backpacking. 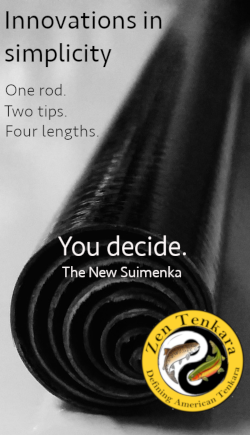 For all I care, people can go buy them directly from Tenkara USA or anywhere else they’re available instead of me. I really just want to help get the message out about them. The truth is, I haven’t even touched any of my Western fly rods since the day I first cast my Tenkara USA Iwana. That doesn’t mean I won’t ever fish with a reel again. I’m just enjoying Tenkara too much right now. Anyone who has fished with one probably knows what I’m talking about. As for DIY content, I already have some fly-tying videos in the blog for those of you who tie and have some other videos and blog posts planned for DIY backpacking and flyfishing gear. I hope you enjoy them! Thanks for all the great info Jason. I like the simplicity & layout of your site – too many other websites are padded with useless info which leads to end user confusion, & ultimately lost viewers. Most people posting on forums don’t realise that they are actually providing commercial endorsement for a variety of companies products. An angler will say he absolutely loves XYZ brand of rods for their action, weight, responsiveness etc. ABC brand of reel is good because of yada, yada, yada & so on. The videos are a great source of info – much better than trying to gauge the effectiveness of a product from a picture alone. Thanks for sharing this article. I really like to hear so much about keeping backpacking as light as possible. Thank you for the idea. Jason you seem open to this discussion of the merits of less expensive telescopic rods for Tenkara fly fishing. The prices on the TenkaraUSA rods are fine. I have paid close to that for rod blanks. I do like to save money since I am retired, though. The sourcingmap.com rods sound interesting but I wonder about “plastic”. Would it have the spring and life of graphite, even good glass? Cabela’s offers a Graphite “Telescopic Panfish Pole” In 10foot, 12foot, and 15foot $14.99 – $24.99, Item:IA-115800. I wonder if this might not be a better option. Has anyone tried these for Tenkara? After my comment above I noticed there were review comments on the Cabela site, 23 in this case, a mixed bag of reviews, mostly 5 stars but a number of 1s, and one comment from a buyer wanting it for Tenkara. That person found it stiff, cheap, and thought it was about to break. Hard to tell the quality of a rod or pole until you pick it up, load and unload it. You can try it but I think you’ll be disappointed with the action. These rods are not designed to cast like a fly rod. Daniel at Tenkara USA spent a lot of time designing the tapers of his rods and did a lot of experimentation to get them to perform just right. Panfish rods have not gone through this process and are not intended (nor designed) to perform like a fly rod. There’s a lot of science behind casting which didn’t go into the panfish rods and did go into Tenkara rods. You could save a lot of money by buying that rod from Cabela’s but I think you’ll be pretty frustrated when you can’t get the fly to the fish in front of you. Know what I mean? I carry nymphs and wets but almost exclusively dry fly fish. There’s just not much need to nymph where I go. I pretty much fish an elk hair caddis or a Griffith’s Gnat but carry some other standards like Adams, beatles, BWO comparaduns, ect. How ofter fo you find yourself switching flies in a given day? In a spring creek, I could see the need more than in a freestone stream or tailwater. People have actually caught quite big fish on Tenkara rods. A more powerful rod like the Yamame would probably work better on tailwaters with bigger fish. If you want something more in a mid flex though, the Ayu would be a good choice. Many consider it to be a good all around rod and the longer length works better on bigger rivers. Plus, the mid flex action gives you pretty good tippet protection on light tippets with bigger fish.